Rami Hamdallah interview: Palestinians seek U.S., U.N. intervention to aid two-state solution. An interview with Palestinian Prime Minister Rami Hamdallah. 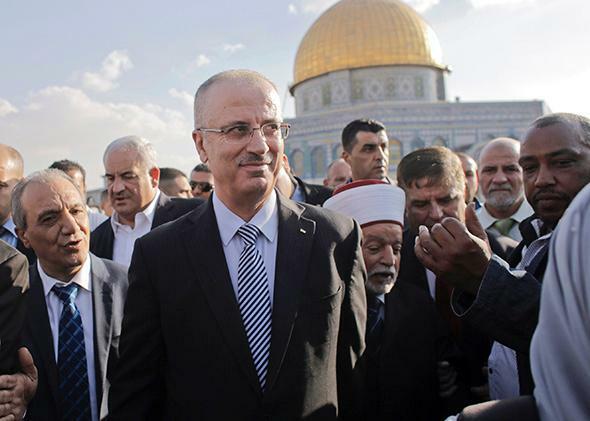 Palestinian Prime Minister Rami Hamdallah visits the Dome of the Rock on the compound known to Muslims as Noble Sanctuary and to Jews as Temple Mount, in Jerusalem’s Old City on Oct. 27, 2014. What do you hope to accomplish as prime minister? I hope we will be able to end the occupation and to establish the Palestinian state with ’67 borders and East Jerusalem as its capital. How do you feel when you look at the new [Israeli government led by Benjamin] Netanyahu? We are willing to work with any government that is elected in Israel. We hope negotiations will be resumed, but within a new framework. We need a time limit for the Israeli withdrawal from our territories and a date for the establishment of the [Palestinian] state—the leadership in Palestine has put the date as the end of 2017. So isn’t that a precondition for restarting talks? It’s not a precondition. We want a U.N. resolution that can guarantee an establishment of a Palestinian state. Wait, but you said in order to start talks, you need a time limit for the withdrawal of Israel’s troops. Does that mean you won’t start talks until those conditions are met? There is the French initiative now, in coordination with the United States, and they talk about a time limit. This U.N. resolution can be issued, which would set a time to end the occupation and establish a state along the ’67 borders. If this is issued, I’m sure we can go back to negotiations. Whether it is through the French initiative, or any other, we [want to] get a guarantee for a time limit for the Israeli withdrawal and the establishment of the state and a freeze of settlement activities. But you know that the Israelis are not going to go for any preconditions? But these are not preconditions. You know, settlements are illegal. But if you were the Israelis, why would you enter into negotiations if you’ve set [in advance] the terms of their withdrawing their troops by 2017? We’re going to the international agencies, the Security Council. Have you given up on direct Israeli-Palestinian negotiations? We are going to negotiations through the U.N. So you’ve given up on direct talks? We’ve experienced direct talks, and they were a failure. So you feel the Palestinian state can be imposed from the outside? Nothing can be imposed from the outside. We need negotiations between us and the Israelis sponsored by the United States, by the U.N., by the [European Union]. We need outside intervention from the U.N., from the superpowers, from the United States. Once there is a resolution, whether the U.N. asking for Israeli withdrawal and for the establishment of the state, this has to be guaranteed by the superpowers. Otherwise, it will be just a paper. We hope that the United States’ intervention can help us. You think the outside pressure on Israel will be enough? Yes, I think the intervention of the U.N. and the superpower countries is important to convince Israel to reach a peaceful settlement. The Israelis worry that their security might be at risk. So [Palestinian Authority] President [Mahmoud] Abbas suggested to them that we would be willing to have Palestine as a demilitarized state. We suggested to them that they bring any third party to the borders between them and us. We told them, Choose any country except Israeli soldiers. And they said they don’t trust anyone. What can we do? But you know perfectly well that international troops are a red line for Israel. We are a nation and need to live in harmony and peace also. We have been under occupation for 48 years. We need to get rid of the supervision. Reportedly in Washington they have also given up on negotiations and are looking around to see what the alternatives are. The obvious alternative that you mentioned is the French resolution at the United Nations. We have had certain assurances from the United States that after the Iranian deal, they will resume negotiations between us and the Israelis. We count on the [United] States and are sure they will deliver. Is your sense that the Obama administration might either not veto or might support the French resolution in the Security Council? What we hear is that there is coordination between the French and the [United] States. What do you say to the Israelis who say, We withdrew from Gaza, we tore up all the settlements, we withdrew from Lebanon, and all we got was a bunch of rockets aimed at our cities? What do you say to reassure them about their security if the West Bank is turned over [to the Palestinian Authority]? Look at the West Bank now—we are keeping law and order to the maximum. If we get a peaceful settlement and an agreement with Israel, guaranteed by the U.S. and other countries, I’m sure we can live in paradise here—both of us. Separation walls will not bring peace. I myself personally look for a bright future for Israeli children and our children. We don’t like to be at war with our neighbors. This is my message to the Israeli readers. We want to reach a historic, peaceful, and everlasting settlement and are willing to give all our security assurances provided we get our rights and an independent, sovereign Palestinian state.